From his early interests in Einstein and Newton, Jian-Ping Chen created a career in science to make a difference in this world. Growing up in the bustling city of Shanghai during the Cultural Revolution, books were difficult to find. “Anytime I could find written words, I would bring it home to read,” Chen said. Chen’s middle school teacher had mentioned Albert Einstein and Sir Isaac Newton in class, so he knew what kind of books he was looking for and he knew what he wanted to become. Chen found books from his friends who had kept books in their personal homes. “Reading books shows you there’s a great world outside,” Chen said. Due to the Cultural Revolution, a sociopolitical movement launched by Mao Zedong from 1966 until 1976, Chen’s early academic experiences were relaxed, requiring him to seek out and nurture his own curiosities. Chen turned to reading books he managed to find and playing mind games. After completing his studies at the University of Science and Technology of China, Chen was selected to take the China-U.S. Physics Examination and Application (CUSPEA), an exam and admission system used by physics departments to place students from China into American and Canadian Universities between 1979 and 1989. At the age of 22, Chen packed his bags and moved to Charlottesville, Va., for graduate studies at the University of Virginia. A UVA professor leading a team of physicists from UVA and other universities in the southeast region performed an initial study and proposed a multi-GeV continuous electron beam accelerator facility, CEBAF. Chen was excited when CEBAF (later changing its name to Jefferson Lab) was approved. After two years of postdoc work at MIT, Chen became a Staff Scientist at Jefferson Lab in 1994, making his way through the ranks to Senior Staff Scientist in 2011. 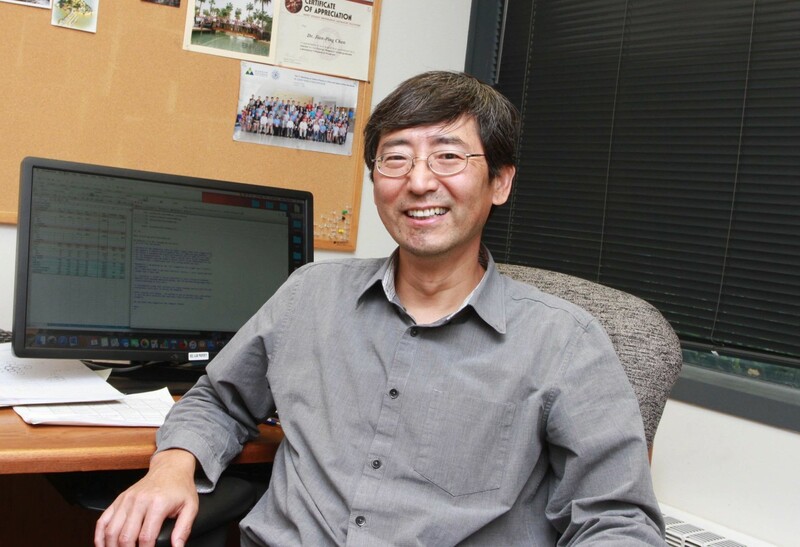 Focusing on nucleon spin-flavor and 3D structure studies, Chen has led a number of Jefferson Lab experiments to completion and has mentored dozens of Ph.D. students. “I work with students closely and make sure they stay on track,” he said, laughing. While working on experiments and projects can be difficult, Chen’s largest challenge as a scientist is convincing people that certain science is important. Chen applies that mentality to his research proposals, backing each proposal with an enthusiasm. On a daily basis, Chen is always working in the past, present and future. He works on guiding students to analyze data from past experiments and to write, edit and publish papers. He also works on projects and preparations for upcoming experiments, while working on the future Solenoidal Large Intensity Device project. SoLID is a large acceptance detector system that can handle high luminosity. Once built, SoLID will greatly enhance the Jefferson Lab capability to fully exploit the potential of the 12 GeV energy upgrade. “We really want our new detector system,” Chen said, bubbling over with excitement. Growing up the youngest of five siblings and now serving as a scientist, tolerance is another skill life taught Chen. A father to his son and partner to his wife, Chen hopes to continue contributing to science and the broader world that science touches. One of Chen’s hobbies is the game of bridge, a mind game he learned as a child and continues to play in tournaments whenever time allows. Jefferson Science Associates, LLC, a joint venture of the Southeastern Universities Research Association, Inc. and PAE Applied Technologies, manages and operates the Thomas Jefferson National Accelerator Facility, or Jefferson Lab, for the U.S. Department of Energy's Office of Science.DOE’s Office of Science is the single largest supporter of basic research in the physical sciences in the United States, and is working to address some of the most pressing challenges of our time. For more information, visit science.energy.gov.